Admit it, we all love getting things in the mail. Adults may not like the bills, but most other items are welcome, especially magazines to read for pleasure. Kids today are lucky, there are a lot more magazines specifically geared to children. NHL, now six, has had magazine subscriptions to several different publications. JSL, almost three, was still a little too young for most of them. Recently, I was asked by Family Review Network to review National Geographic Little Kids magazine. I had heard about it, but had never actually seen it at stores. The concept intrigued me since it is made for children ages three to six. I figured this was a great opportunity to see how kids on both ends of the age spectrum liked the new magazine. Aimed at preschoolers ages 3 to 6 and their parents, National Geographic Little Kids is the magazine for young explorers, packed with teaching tools to help parents inspire a love of learning in their children. The Association of Educational Publishers chose National Geographic Little Kids for its highest award, the Golden Lamp, in 2008 and named the magazine Periodical of the Year in 2008 and 2009. National Geographic Little Kids also won a Parents’ Choice Gold Award for 2008, 2009 and 2010. Filled with lively photographs and engaging stories to develop prereading and early reading skills, plus interactive picture games and puzzles to teach logic and counting, each 24-page issue contains fresh and imaginative instruction tools. There are captivating animal stories, answers to questions on kids’ favorite topics, features on different cultures to inspire a sense of understanding about the world, plus interactive experiments to introduce simple science. Each issue also includes a set of six wild animal cards. National Geographic Little Kids is a perfectly sized magazine for little hands, at approximately 6 1/2” by 7”. 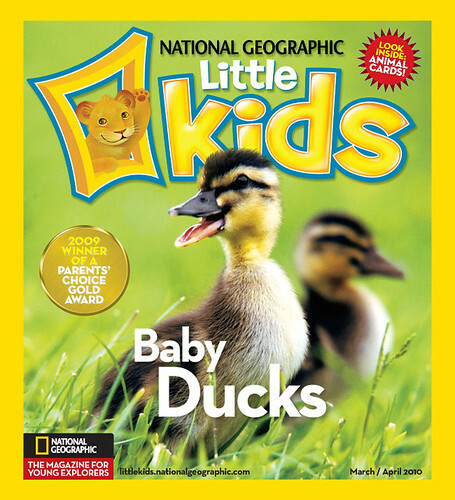 National Geographic Little Kids is available by subscription for $15 a year (six issues; international subscription cost varies) and on newsstands for $3.99 a copy. Explore online at littlekids.nationalgeographic.com. NHL immediately took the National Geographic Little Kids and went to the couch to read them. We received the current issue (seen above) and three past magazines to review. He immediately dove into the January/February 2010 issue with Lion Cubs on the cover. NHL adores lions and wanted to get inside to see what he could learn. As I watched him reading, he had no trouble with the words. He could quickly read from cover to cover and tell me about the photos and items inside. He had fun trying to tell what the items were on the Naming "What in the World Are These?" activity page. When he got to the pages on the lions, he was mesmerized with the photos of the lion cubs. True to National Geographic, the photos are stunning and surrounded by just the right amount of print for this age group. Next, NHL did the Little Lions Maze and named all of the other animals in the picture. As a parent and teacher, I really liked how National Geogrpahic Little Kids puts a little of everything into these magazines. There is a Geography section filled with maps, vocabulary and pronunciations of foreign words (like Phane in Botswana). If this is not included, a Culture section is given with similar items for children to learn some new words. For my younger son, JSL, there was a matching game. When JSL heard what his big brother was doing, he jumped in and was able to do a nice introductory matching game with mittens. There were also rhyme time pages as well as sorting out which item in a photo is different than the others and how are they the same. 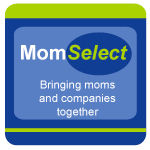 Great early learning skills for an almost three year old. An activity page with a craft item is also included. The items that are needed are clearly labeled and photos of children with finished projects as well. 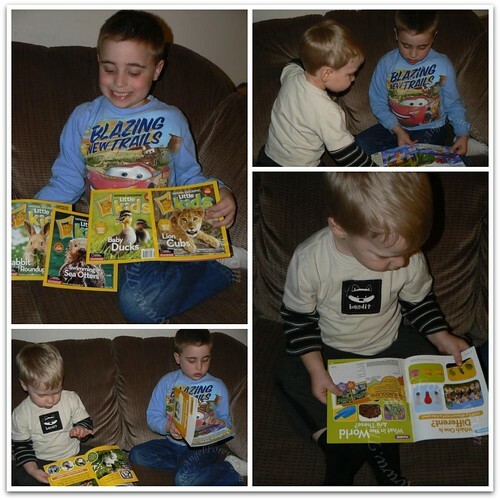 The boys are both eager to try some of the ones included in the National Geographic Kids. As a Science geek, I loved the Science Experiment pages. Past issues had Drawing With the Sun, Spinning Eggs, Balloon Trick and my personal favorite Dancing Raisins. When NHL was looking at the January/February 2010 issue, the Dancing Raisins immediately caught my eye. I actually did this experiment in my classroom with older elementary students. It was presented in a developmentally appropriate way to teach 3-6 year olds the wonder of buoyancy. Kuddos to National Geographic for making science fun! Over all, we really enjoyed National Geographic Little Kids. I do feel that the magazine in general is probably a little too young for my first grade son. He enjoyed the photos, but often wanted more than the text offered to him (good thing they have National Geographic Kids for his age). I do believe that we may ask someone in our family to get JSL a subscription to National Geographic Little Kids for his birthday (this May). Although parts will be over his head, the general feel of the magazine will offer a lot of great subjects to him for exploration. Of course, mommy will be just as excited to see it come in the mail. If you are interested in subscribing to National Geographic Little Kids, they have given a special URL with information about it. Please click here for details. Thanks to National Geographic Kids, one lucky reader will win a copy of the current National Geogrpahic Little Kids magazine. MAIN RULE – Answer the following questions: If you could pick an animal to feature on National Geogrpahic Little Kids, which animal would it be and why? 1 Bonus Entry – Head over to National Geographic Little Kids website and tell me an activity, recipe, or experiment that you would like to try and why. To enter, please follow the rules above within the comment section. 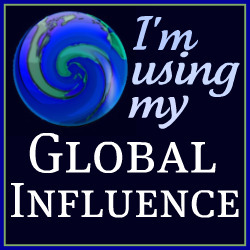 Contest starts today April 12th and ends at 10:59 EST on April 25, 2010. You do not have to be a blogger to enter, but must leave a valid e-mail address for me to contact you for mailing address once the giveaway is over. I will select the winner using random.org and contact you via e-mail. You will have 48 hours to claim the prize. If there is no response, another winner will be selected. Open to U.S. residents only. Disclosure: This post was written for Family Review Network as part of a program for National Geographic, who supplied the magazines for review and giveaway. No other compensations was given. The opinions expressed in the review are my own feelings about the product. No need to enter me into the contest – just wanted to concur with your review. Abby has just gotten a subscription from her Nana and we are loving it in our house! Good stuff. So many different animals to choose from. I think I would have to go with Icelandic Sheep because my friends parents have them on their farm and think the kids would love to learn more about them. They go up there sometimes and help out with the lambs. They also love seeing the ‘guard llamas’ if you look around Im pretty sure there are some pics of the kids on there. .-= QCMAMA´s last blog ..Dear Kid Saturday, =-. Sharks! My daughter is currently obsessed with them. My daughter would love the Rainbow Flowers activity! I just commented on Yom HaShoah 2010. I entered your Dove giveaway. I entered your Human Nature giveaway. Thanks to all that entered. The giveaway is closed and the winner will be receiving an e-mail from me very soon.